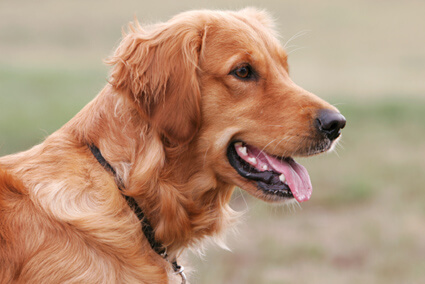 For over 20 years, Golden Retrievers In Need (GRIN) Rescue Service has been providing care for abandoned purebreds in northeastern Ohio, western Pennsylvania and nearby communities. The retrievers welcomed into GRIN’s foster-care program come from a variety of situations – local shelters, wandering the streets, even from pet parents forced by financial hardship to relinquish their dogs. Partnering with local veterinarians, team members ensure that every intake receives a full medical work-up to assess and address individual needs prior to final adoption. Since its inception in 1992, this non-profit organization has a proven track-record for success, placing over 2,600 Goldens in loving homes. The all-volunteer staff at GRIN has witnessed a wide scale of abuse and neglect among the many dogs that have come into their care. They’ve helped canines make recoveries that are nothing short of miraculous. In just the last year, they admitted two Goldens who share an ideal target weight of 75 lbs. (based upon their age, height and other factors), but their conditions at the time of their rescues could not have been more different. Dakota, neglected and chronically underfed to the point of starvation, weighed a mere 30 lbs. The other, named Heath, was severely obese, topping out at 145 lbs. Without GRIN’s intervention, these dogs likely would not have survived. Recently, GRIN was asked to take guardianship of a special-needs puppy. 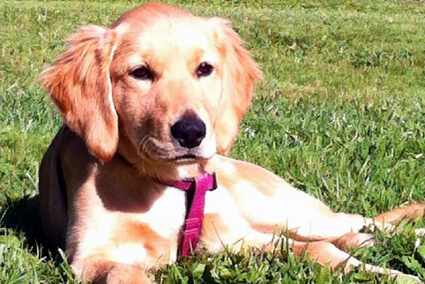 Described as ‘happy-go-lucky’ and ‘spunky’, Missy is a six-month-old Golden Retriever. Gazing upon her beautiful face, you’d never guess that she was born with a genetic defect. The condition is referred to as an ‘ectopic ureter’, which means that her kidneys and bladder were not naturally connected. One veterinary surgeon labeled her situation as an ‘extremely complex abnormality’. Because both ureters were emptying urine into her abdomen and reproductive system, she had zero ‘bladder control’ because there was no bladder to control. 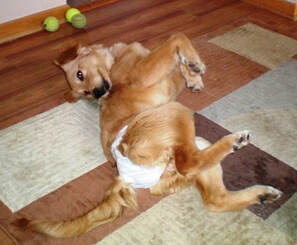 All of her short life, Missy has had to wear a diaper at all times. Due to the severity of her condition, surgery was the only viable option for improving her quality of life. Our financial assistance helped to cover some of the costs of Missy’s operation a couple of weeks ago. The surgery took a toll, as she experienced a post-operative infection. However, after a few days in ICU, Missy bounced back and is now an active, happy pup with a healthy appetite. It will be at least another week before her doctors are able to gauge the success of the procedure, but they’re encouraged with her resilience and spirit. Even though it’s possible that this little Golden will need to undergo additional treatments and therapies before she’s made completely whole, it’s hard to imagine her receiving better care than that provided by this amazing rescue group. Until her medical issues are resolved, Missy’s adoption status will remain on-hold. In the meantime, we will keep her in our thoughts, and hope that her recovery is swift and lasting. If you would also like to keep track of this sweet girl’s progress, you can go to grinrescue.org, where they’ll be providing periodic updates about her condition. 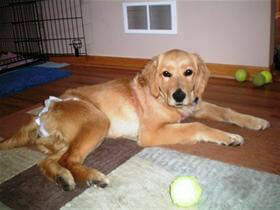 At GRIN, every day presents the possibility of making a positive difference for a special retriever. As we’ve just seen, they never pass up on a chance to make an opportunity golden. We thank you for helping us make this small step toward a better life possible for this beautiful dog, as well as all the other steps we take to help animal rescue groups across America. Your personal donations and continued business make this and every grant possible. This holiday season, any contribution you make will help to ensure that deserving groups like GRIN continue to receive much-needed financial support. We will be thrilled to receive a donation, in any amount. It's very important for GRIN to note that Missy came to us through Club Pet Adoption Inc. of Transfer, PA. Their founder spearheaded fundraising efforts and while they raised almost $2k for her needed surgery, it just wasn't enough to meet her medical costs, especially in light of the fact that she may require a second surgery. They reached out to us, keeping Missy's best interests first, asking GRIN to take her into our organization and generously donated what they'd raised and pledged to continue to raise funds for her cause. It says a great deal about rescue groups working together for the good of the dog! Thanks to all involved in the care Missy this is such a heart touching event to have happened to one of our fellow Golden's! I'd like to thank all the rescue organization's and for all those living and loving these puppies and kittens, dog's and cat's each day of their lives God Bless each and everyone of you! I am so very touched by this story of Missy I wish and pray for her recovery to be successful. I am a Golden Lover for 30 plus years and I've never heard of this happening to any dog it's amazing what can happen to our furry friends and it's a Blessing you've taken care and help her again thank you and keep up the good lov-in!